Two seasons ago Brian Dozier dramatically altered the trajectory of his career at age 26, going from light-hitting fringe shortstop prospect to starting-caliber second baseman. Last year he made another big jump, emerging as one of MLB's best all-around second basemen by combining power, patience, speed, and defense. This season he's again taken a huge leap, ranking among the best dozen players in the entire league during the first half. Dozier is often overlooked, in part because his turning into a star came as such a surprise and in part because many people still misguidedly focus on batting average. But make no mistake: He had a spectacular first half. Dozier played 88 of 89 games, leading the league in extra-base hits (48) and ranking second in runs scored (67), third in doubles (26), seventh in homers (19), and 10th in slugging percentage (.513) while grading right around average defensively. He's developed into one of the best power hitters in the league, which is amazing for a 5-foot-11 middle infielder who had a grand total of 16 homers in 365 games as a minor leaguer. In addition to crushing high fastballs Dozier draws walks, steals bases, and plays good defense at an up-the-middle position, which is why FanGraphs pegs him as the eighth-best all-around position player in the league at 3.3 Wins Above Replacement. He was, without question, the Twins' first-half MVP. Joe Mauer had a solid April, slumped badly from May 1 through mid-June, and finished the first half by hitting .320 with four homers in his final 25 games. The end result is an underwhelming .271/.336/.387 line that looks much like his underwhelming .277/.361/.371 line last year and has me wondering whether the .320-hitting on-base percentage vanished the moment he suffered a concussion in August of 2013. His strong recent play puts those thoughts on hold for now and Mauer's actual impact out-paced his raw numbers thanks to hitting .380 with runners in scoring position and .400 in high-leverage spots. Mauer leads Twins hitters in Win Probability Added by a wide margin because he was great in game-changing situations even while being mediocre overall. Counting on that to continue is optimistic to say the least and Mauer was a below-average first baseman in the first half. Because he went from light-hitting shortstop prospect to good-hitting third baseman, whenever Trevor Plouffe puts together a good stretch offensively many people are quick to expect further development. Instead he's been remarkably consistent since becoming an everyday player and this season's production (.769 OPS) is very close to his numbers in 2012 (.751 OPS) and 2014 (.756 OPS). He's basically been a .250/.315/.440 hitter now for four years. What has changed is that Plouffe went from being very rough defensively at third base to being solidly above average at the position, which is perhaps what should have been expected from a career-long shortstop making the transition in the majors. This season, like last season, Plouffe has been above average offensively and defensively to rank as one of the dozen best all-around third basemen in baseball. He was the Twins' second-best position player in the first half. Torii Hunter continues to hold off father time, putting together the same type of season for the Twins at age 39 that he had for the Tigers last year. He's been slightly above average offensively, making up for a 30-point drop in batting average with increased power and more walks (24) than he drew all of last season (23). Hunter has been extremely streaky, with a handful of huge games surrounded by mediocrity, but a .750 OPS at age 39 is as good as anyone should have expected. Defensively he's rated somewhere between mediocre and poor, but either is a huge upgrade over the awful numbers he had as the Tigers' right fielder. Paul Molitor has also given Hunter plenty of time off from fielding with 11 starts at designated hitter. Slightly above average offensively and slightly below average defensively equals an average all-around player. That doesn't come close to matching the Hunter-as-savior hype train, but it certainly tops my modest expectations. Kurt Suzuki parlayed a good first half last season into his first career All-Star appearance and a two-year, $12 million contract extension from the Twins, at which point the magic wore off and he resumed not hitting. Suzuki has played 112 games since signing the deal, hitting .240/.291/.333 to basically match his .237/.294/.357 mark from 2010-2013, and this season his .604 OPS ranks 22nd among the 25 catchers with 200 or more plate appearances. Suzuki's defensive reputation has always been excellent, but his defensive numbers have always been terrible and this season is no exception. He's thrown out 20 percent of stolen base attempts, his pitch-framing rates below average, and while he's been charged with few passed balls Twins pitchers have racked up tons of wild pitches with him behind the plate. Add it all up and Suzuki has been one of the league's worst regulars. Danny Santana's great, out-of-nowhere rookie season carried with it several red flags, including a bad strikeout-to-walk ratio, unsustainably high batting average on balls in play, and iffy track record in the minors, but no one could have expected this type of collapse. His batting average is down 100 points, his power has been sliced in half, and his strike zone control has gone from bad to horrendous with 59 strikeouts and four walks. He's been one of the five worst hitters in MLB. And he's been nearly as bad defensively despite moving back to his natural position of shortstop after being forced into action as a center fielder last year. Santana has committed 13 errors in 58 games at shortstop and Ultimate Zone Rating, Defensive Runs Saved, and Plus/Minus agree that he's been 5-10 runs below average. Santana made lots of errors and hit .274/.317/.397 with bad K/BB ratios in the minors and that's no longer masked by a shockingly good rookie campaign. Eduardo Escobar is a good-fielding shortstop with a decent bat for the position, but he's been asked to play mostly left field and designated hitter with predictably poor results. He's made 33 starts at left field/DH compared to 17 at shortstop, which has changed the perception of Escobar's value. Playing shortstop while hitting .254/.285/.403 would make Escobar an average regular, but a sub-.700 OPS looks totally different in left field and his outfield defense isn't pretty either. Escobar is held back by terrible plate discipline, which includes a 48/8 K/BB ratio this season, but the bar for offense at shortstop is low enough that hitting .250 with gap power and non-existent strike zone control is perfectly reasonable when combined with solid defense. It makes no sense to play Escobar at a position where his bat and glove are both weaknesses, especially when Santana has been a mess at shortstop. Escobar is who he is. His team needs to utilize his skills better. Molitor and the Twins were convinced that Eddie Rosario was more ready for the majors at age 23 than his mediocre numbers in the minors suggested and through 55 games his .284/.310/.418 line narrowly tops his .255/.300/.400 line at Double-A and Triple-A. His inability to control the strike zone in the minors has carried over with an ugly 47/8 K/BB ratio, but thanks to the smooth swing that Molitor and company rave about he's still been able to hit .284 with decent power. Offensively he's been below average and more Triple-A time to work on plate discipline and trying to hit left-handed pitching might make sense, but Rosario has held his own enough to avoid being a weakness. And he's been very good defensively, showing plus range and a strong arm shifting between left field and right field. Rosario has plenty of rough edges to smooth out if he's going to become a great player, but he's already pretty close to being a good one. Kennys Vargas was handed the Opening Day designated hitter job, lost it, reclaimed it, lost it again, and got demoted to Triple-A and then to Double-A, all within three months. In between he hit .245/.277/.365 with a hideous 48/7 K/BB ratio in 47 games to lose the Twins' faith. As a rookie his 63/12 K/BB ratio in 53 games wasn't much better, but no one seemed to care because he hit .274 with plus power. He has a lot to prove if he's going to re-enter the Twins' long-term plans. After horrible rookie and sophomore seasons the Twins overhauled Aaron Hicks' approach at the plate and sent him to Triple-A. He thrived there to earn another chance and the results have been a mixed bag. Hicks looks like a different hitter--less patient, more aggressive--and his production is up recently, but he continues to be a switch-hitter with an extreme platoon split. His defense and baserunning have improved, but it's still unclear if he's a good part-time or a starter. Signed to a minor-league contract after a decade in the Cardinals organization, Shane Robinson made the team out of spring training and has played a bigger role than expected while starting 30 games. He hit .343 in April, but quickly turned back into a pumpkin and has hit .195 since May 1. Robinson's overall numbers match his underwhelming career marks and there's no reason for him to be starting games as a corner outfielder for a team struggling to score runs. Eduardo Nunez has hit and fielded better than ever, posting the second-best OPS on the team and even rating as a neutral shortstop after previously having some of the worst numbers at the position in baseball. His limited playing time means viewing all of that skeptically and the Twins still don't seem to trust him as an appealing shortstop option. Nunez may finally be taking a step forward at age 28, but more likely is that performances vary wildly in small samples. 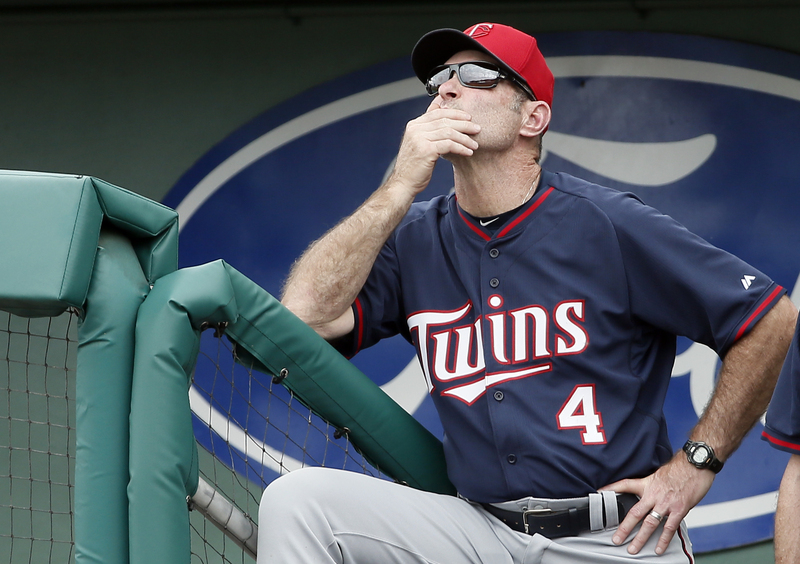 Season preview: Are the Twins ready to stop losing? Nearly everyone involved with the Twins, from players and new manager Paul Molitor to general manager Terry Ryan and owner Jim Pohlad, seems convinced the team is poised to take a big step forward. Nearly everyone not involved with the Twins, from national writers and Las Vegas oddsmakers to numbers-driven projection systems and cranky local bloggers, seems convinced the team is headed for another last-place finish and possibly a fifth straight 90-loss season. Sports Illustrated picks the Twins for last place and 67 wins. ESPN.com picks the Twins for last place and 68 wins. Baseball Prospectus projects the Twins for last place and 71 wins. Bovada sets the Twins' over/under win total at 72.5. FanGraphs projects the Twins for last place and 74 wins. 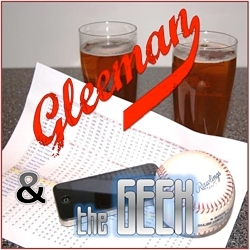 Grantland picks the Twins for last place and "under 75 wins." CBS Sports picks the Twins for last place. Yahoo Sports picks the Twins for last place. You get the idea. Last year the Twins were 72-90. 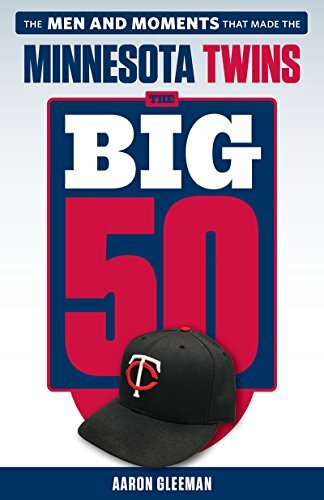 Then they fired Ron Gardenhire after 13 seasons as manager, handed out the largest free agent contract in team history to 32-year-old Ervin Santana at $55 million over four years, brought back Torii Hunter for a $10.5 million reunion at age 39, signed 33-year-old reliever Tim Stauffer for $2.2 million, and bypassed young talent in favor of veteran mediocrity for every roster spot up for grabs in spring training. Those are all the moves of an organization that's sick of losing and also sick of their plummeting fan morale and season ticket sales. They spent big on veterans and further delayed the arrival of prospects, leading to an Opening Day roster with just four players who're 25 years old or younger in shortstop Danny Santana, left fielder Oswaldo Arcia, designated hitter Kennys Vargas, and Rule 5 pick J.R. Graham. This is a rebuilding team in the sense that the Twins have been very bad and are still attempting to get back on track, but it's anything but a young team. 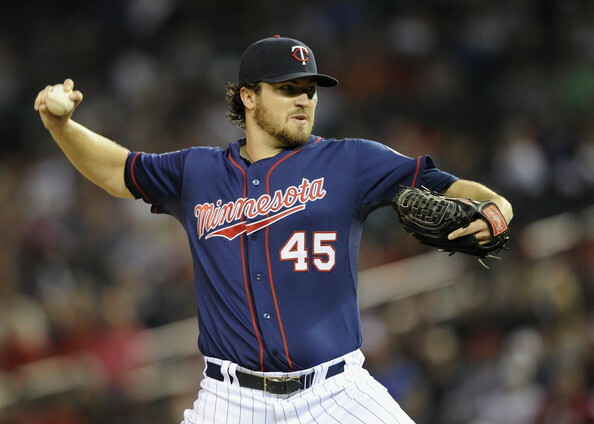 Kyle Gibson is the youngest member of the starting rotation at 27. Graham is the only member of the seven-reliever bullpen under 30. Six of the nine starting position players are at least 28. In terms of their collective average ages, the rotation is 30, the bullpen is 31, and the lineup is 29. When the reality of the Twins' organizational collapse finally sunk in around mid-2012 or so the idea was that they'd be back to contending by now, but injuries ruined those plans. Joe Mauer's concussion derailed his career and turned him from a Hall of Fame-caliber catcher to a mediocre first baseman. Instead of making their MLB debuts Miguel Sano missed all of last year following elbow surgery and Byron Buxton missed all but 31 games with a wrist injury and a concussion. Buxton and Sano will begin this season as teammates at Double-A, the Twins sent 25-year-old pitching prospects Alex Meyer, Trevor May, and Michael Tonkin back to Triple-A rather than trust them with roster spots that went to Tommy Milone, Mike Pelfrey, and Blaine Boyer, and after back-to-back Opening Day starts in center field Aaron Hicks is back in Rochester too. Toss in Arcia's development stagnating a bit and it's easy to see where the rebuild sputtered. The good news is Buxton and Sano remain superstar-caliber prospects, Meyer and May still have enough upside to project as impact pitchers in some role, and there's another wave of prospects coming soon led by Jose Berrios, Jorge Polanco, and Nick Burdi. The bad news is none of that figures to actually help the Twins win many games before the All-Star break. Sadly, being a Twins fan in 2015 is still more about waiting for help to arrive than watching it play at Target Field. 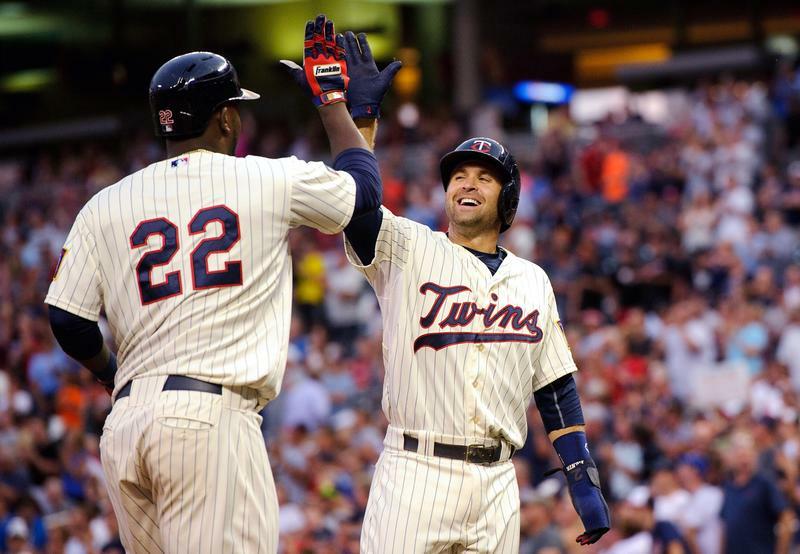 There's a lot of optimism surrounding the Twins' offense after the lineup produced the fifth-most runs in the American League last season, but building on or even duplicating that performance is hardly a sure thing. For starters, Santana was the only hitter on the team to crack an .800 OPS last season, coming out of nowhere to hit .319/.353/.473 as a rookie after batting .273/.314/.388 in the minors while failing to top a .725 OPS at Single-A, Double-A, or Triple-A. Santana is good enough, young enough, and skilled enough to buy into reevaluating his upside compared to what his minor-league track record suggested, but his rookie success was still driven by an unsustainable .405 batting average on balls in play and came despite an ugly 98/19 K/BB ratio. The combination of a so-so track record, poor plate discipline, and a high batting average on balls in play makes him a prime regression candidate. Brian Dozier also needs to fight his track record to show his 2014 was for real, albeit to a lesser extent than Santana. He was the Twins' best all-around position player, hitting .245/.345/.416 with 23 homers, 21 steals, 89 walks, and solid defense to rank among the top half-dozen second basemen in MLB. Clearly the Twins buy into Dozier's age-27 breakout, but prior to 2014 he hit just .240/.297/.384 in the majors and .232/.286/.337 at Triple-A. Kurt Suzuki was another source of unexpectedly strong offense, hitting .288/.345/.383 to make his first All-Star team at age 30. As with Dozier the Twins bought into his resurgence with a new contract, but Suzuki hit .253/.313/.362 in the second half to resemble his measly .237/.294/.357 line from 2010-2013. Jordan Schafer's track record strongly suggests he'll be unable to repeat his 41-game Twins showing and Hunter is fighting father time at age 39. All of which isn't to say the lineup lacks the ability to improve in spots. Mauer getting back to his usual self would be huge and he hit .300 with a .400 on-base percentage in his final 55 games. Arcia should take a step forward at age 24 and is capable of breaking out with a better approach. But for the most part more hitters are likely to decline than improve, some by wide margins. 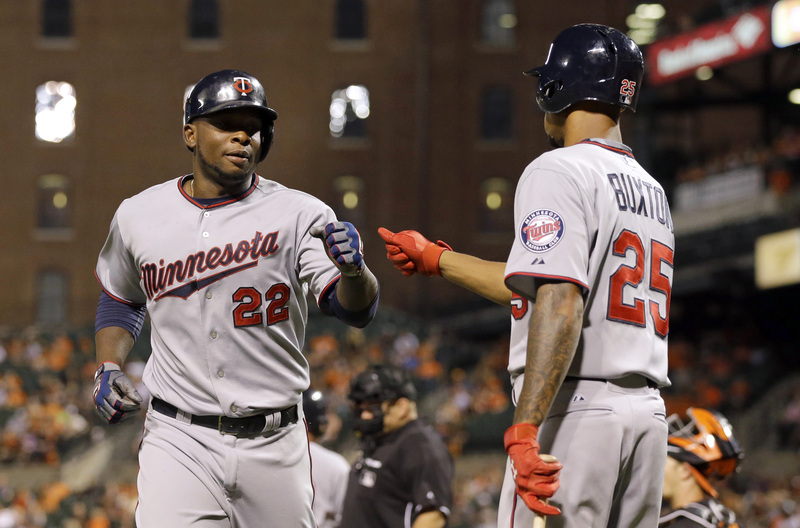 Of course, Buxton and Sano showing up in May or June ready to thrive could change everything. Then there's defense, which has played an overlooked part in the Twins' struggles as the focus tends to be on the "pitching" rather than the run prevention of pitching plus defense. Combined from 2011-2014 the Twins ranked 28th in Ultimate Zone Rating at 90 runs below average and 24th in Defensive Runs Saved at 115 runs below average. They've been horrendous, especially in the outfield, which is doubly bad combined with fly-ball, strikeout-phobic pitching staffs. Infield defense may not be bad because Dozier is solid at second base, Santana has the skills to be a plus shortstop, Trevor Plouffe showed big improvement at third base, and Mauer is fine at first base. However, the outfield is guaranteed to be a major weakness again. Arcia and Hunter were two of MLB's worst defensive corner outfielders last year and it's asking a lot of Schafer (or Hicks) to cover up their mess when he's actually gotten below average marks in center field. Last offseason the Twins gave a four-year, $49 million deal to Ricky Nolasco and a three-year, $24 million contract to Phil Hughes, and this offseason they took the uncharacteristic pursuit of free agent pitching even further by signing Santana for $55 million. Hughes got three years and $42 million tacked on to his previous deal following a breakout 2014 season and the Twins have Pelfrey and Milone under contract for a combined $8.5 million in 2015. That's a lot of resources devoted to veteran starters and there's also a hidden cost that comes with having pitchers with guaranteed salaries locked into rotation spots that might otherwise be handed over to prospects. Hughes is signed through 2019, Santana is signed through 2018, Nolasco is signed through 2017, and even though Pelfrey and Milone aren't signed beyond this season the Twins were still hesitant to push them aside. Hughes was a tremendous find on what was a very reasonable free agent contract that the Twins turned into a much bigger commitment. He logged 210 innings and pitched even better than his solid 3.52 ERA, striking out 186 and walking 16 for the best strikeout-to-walk ratio in the history of baseball. Asking for a repeat of that performance is wishful thinking, but Hughes seemed like a truly different pitcher last season and enters this year as a clear-cut No. 1 starter. Santana was signed to take over the No. 2 spot and what he lacks in upside he makes up for in durability, although he's probably more of a No. 3 starter on a contending team. Nolasco looked like a No. 3 starter when the Twins gave him $49 million last offseason, but then pitched horribly for several months before revealing he was hurt and is now a question mark the Twins no doubt regret signing. Gibson is the lone homegrown pitcher in the rotation and the former top prospect finally broke through last season to throw 179 innings in 31 starts. He was wildly inconsistent, but the end result was a 4.47 ERA in a league where the average starter was below 4.00. Inducing lots of ground balls helps Gibson make up for a lack of missed bats, but at age 27 and with just 5.4 strikeouts per nine innings his upside looks limited to the back of the rotation. Milone beat out Pelfrey and May for the fifth spot and the soft-tossing left-hander will try to show that his awful post-trade performance for the Twins was due to a benign tumor in his neck that required surgery. Milone was a solid back-of-the-rotation starter for the A's, but Oakland's pitcher-friendly ballpark overstated his effectiveness and helped compensate for a mid-80s fastball. He has a 4.80 career ERA in non-Oakland ballparks. If the goal was to put together a rotation less likely to be a disaster than the 2011-2014 versions the Twins absolutely accomplished that, but the price tags indicate they have much higher hopes and that may be pushing things. This is the worst rotation in the AL Central even if it's assumed Hughes will avoid turning back into a pumpkin and there isn't much upside unless Meyer and/or May hit the ground running soon. And compared to the bullpen the rotation is a strength. Glen Perkins was one of the elite relievers in baseball for 3.5 seasons before melting down late last year while pitching through an injury. The bullpen desperately needs him to be his pre-injury self or things could get very ugly. Casey Fien is the primary setup man. Brian Duensing, who was a non-tender candidate, is the only lefty. Stauffer and Boyer have prominent roles and the Twins are hoping Pelfrey's one-pitch arsenal fits better in relief. It's an underwhelming group. This should be the least-awful Twins team since 2010, but that's not saying much and confidence in even that mild statement dropped when they stacked the roster with Pelfrey, Milone, Duensing, Boyer, Schafer, Stauffer, Shane Robinson, Chris Herrmann, and Eduardo Nunez. That's a lot of self-imposed dreck for a team with better, younger options and there's a depressingly strong chance the same "are the Twins ready to stop losing?" question can be asked 365 days from now. 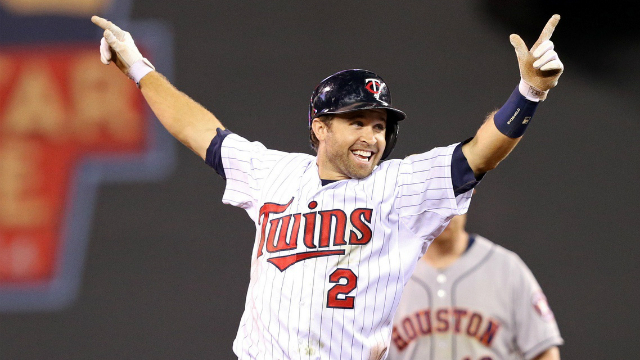 Second baseman Brian Dozier and the Twins have agreed to a four-year, $20 million contract, which begins immediately by bumping his 2015 salary from the MLB minimum to $2 million and then covers his three arbitration seasons at a cost of $3 million in 2016, $6 million in 2017, and $9 million in 2018. Dozier was already under team control through 2018 and this deal does not include any option years, so he remains eligible for free agency after 2018. Typically with these types of contracts there's a tradeoff between guaranteed money and team control. In other words, the player is able to lock in multiple years of salaries rather than going year-to-year with the risk of being released at some point and the team is able to secure option years that enable them to push back free agency if desired. Dozier's contract fits only half of that description: He gets the guaranteed money, but the Twins get no added team control. Instead of going year-to-year with Dozier through his three arbitration seasons at a salary to be determined based on his performance, the Twins have pre-paid for all three seasons. In doing so they gain cost certainty, in case MLB-wide salaries and/or Dozier's production rise dramatically, but they have also committed $20 million more in guaranteed money than was required without gaining any additional team control of Dozier. Dozier and his agent, Damon Lapa, acknowledged the atypical, seemingly one-sided nature of the deal at the press conference announcing the contract. Lapa was quick to point out that they avoided giving up any additional years of team control to the Twins and Dozier called "this type of contract ... very rare" because it contained "no options, no free agent years." Dozier got what he wanted, which was life-changing money, and he didn't even have to pay the usual toll. Cost certainty has some value, of course, and the budget-conscious Twins likely feel particularly relieved to avoid the possibility of paying Dozier bigger money in 2017 or 2018, but cost certainty can also turn into a bad thing and the Twins have seen that happen in the past after unnecessarily locking themselves into good but not great players. Dozier isn't Nick Blackburn or Joe Mays, but then again most people wrongly assumed those deals carried little downside at the time too. Dozier was a very good player last season, making up for a poor batting average with power (21 homers) and plate discipline (89 walks) to produce a .245/.345/.416 line that ranked well above average for second basemen. Toss in solid defense and Dozier ranked among the half-dozen best players at his position. Repeating that performance for the next four seasons would make this contract a bargain for the Twins. Of course, that can basically be said of any long-term contract because they tend to be handed out to players coming off strong seasons and, in Dozier's case, a season that stands out from the rest of his career. Prior to last year Dozier hit just .240/.297/.384 in 231 games for the Twins and .232/.286/.337 in 48 games at Triple-A. His numbers at Single-A and Double-A were much better, but even those were driven by high batting averages and featured minimal power. Dozier is a much different hitter now than he was in the minors and because of that it's especially tough to project his future. Right now he looks like a building block-caliber player by combining power and patience at an up-the-middle defensive position. But going back just a couple years shows Dozier as a mediocre prospect who was in the minors until age 25 and that late arrival also meant he was under the Twins' control through age 31. It's easy to see why Dozier jumped at this deal, but the Twins' motivation isn't as obvious. They could keep him around through 2018 then and they can keep him around through 2018 now, with the only differences being that they've guaranteed him $20 million and no longer have the ability to change their mind if things go poorly for Dozier or a prospect like Jorge Polanco emerges as a younger, cheaper alternative. Hopefully they'll at least save a little money.